WP Registration Auto Approval: Turning this toggle button off will disable automatic activation of WP user accounts. Admin will have to manually activate each account by browsing through the submissions. Comes handy, if you want to manually approve each submission for registration. 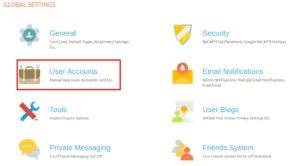 Send user Activation link in email: Turn this option on to notify the user with manual activation link via an email.